On an island on the edge of an immense sea there is a city, a forest, and a boy. The city is called Asteri, a perfect city that was saved by the magic woven into its walls from a devastating plague that swept through the world over a hundred years before. The forest is called the Barrow, a vast wood of ancient trees that encircles the city and feeds the earth with magic. And the boy is called Oscar, a shop boy for the most powerful magician in the Barrow. Oscar spends his days in a small room in the dark cellar of his master's shop, grinding herbs and dreaming of the wizards who once lived on the island generations ago. Oscar's world is small, but he likes it that way. The real world is vast, strange, and unpredictable. And Oscar does not quite fit in it. But it's been a long time since anyone who could call himself a wizard walked the world, and now that world is changing. Children in the city are falling ill, and something sinister lurks in the forest. Oscar has long been content to stay in his small room in the cellar, comforted in the knowledge that the magic that flows from the trees will keep his island safe. Now, even magic may not be enough to save it. I am so thrilled to be participating in The Real Boy Blog Tour today! 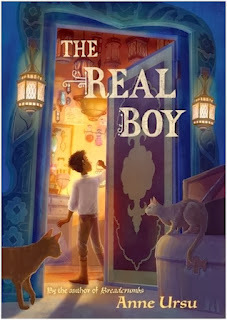 THE REAL BOY was a joy to read and is, without a doubt, one of my all time favorite middle grades books. It is so beautifully written. I'm extra excited today because I get to welcome Anne Ursu to my blog with an interview conducted by her editor, Jordan Brown. I enjoyed reading their conversation and hope you will, too. JORDAN: It’s interesting to me that this is the first book you’ve written that takes place in a completely invented world – your previous fantasy books have all had some sort of significant tether to our world (America, specifically), and feature characters from the present day. ANNE: A few months before starting this book, I thought confidently to myself that I was most interested in contemporary fantasy--that is taking characters from our world and putting them in fantastical situations--and I probably would never write a true fantasy. It was a convenient decision because I've always thought writing a fantasy like that would be impossible. I've noticed that the instant you proclaim anything confidently about your writing, the writing gods smite you. And so naturally the idea I became enraptured with could only be told as a high fantasy. So to say I wanted to try something new would not be quite accurate. I was dragged kicking and screaming. JORDAN: Always the best way to start a new manuscript. What inspired the story, and inspired you to make such a shift in how you write? ANNE: The entire idea for the book came to me while I was watching a marionette show, and so by the time I walked out of the show I knew a few things. I knew I was in a magical forest where the trees were the spirits of old wizards, I knew magical goods would be a commodity, I knew Oscar, my protagonist, was servant to a magician and worked with herbs. I tend to make a few decisions and then just start writing and see what happens. It's not a particularly clean or efficient process! JORDAN: And yet, at the same time, the world still manages to feel “real,” and did even in your first draft. ANNE: Well, good. I wanted to have a few unifying principles so everything felt coherent. This involved making some decisions that wouldn't end up in the book, but would help me as I went along. I placed the island in an alternate universe eastern Mediterranean--and I put the book in time so I could keep the technology consistent. I chose the year 1675--I knew I wanted an early modern society--and so when I needed to put in some detail I would figure out, say, what a carriage might have looked like then. I also tried to account for those pesky human needs like food and shelter, making sure there were resources on the island as well as a history of trade with other countries. I'm not a detail person, so I needed some things to ground me. I'm glad the world held together in the first draft. I felt like I was handing you a drawer full of unmatched socks. JORDAN: Oh, it was a huge mess, generally. But the world, at least, was baseline consistent. When I first started to dig into the editing work, the first thing I started making notes on was the wizard trees, and the long history of this world that we’re only given brief glimpses of in the book itself. ANNE: It was a small mess. One of the many reasons writers need editors, aside from editors' obvious charm and gentle attention to their writers' psyches, is we might not have put all of the things in our head actually on the page. So if you're not living in our head, which few people are, things that are perfectly clear to the writer are not clear at all to the reader. I needed you to tell me what you weren't getting--even if I maybe didn't seem so grateful at the time. Sometimes we'd spend a long time trying to discuss a plot point and eventually realize there was some baseline thing about the world I hadn't communicated--like you assumed the Shining City was rather small, speaking in terms of geography and population, and so a lot of what happened didn't make sense to you. Maybe because I never gave any sense of how big it was in the book. But mostly we ended up needing to get on the same page in terms of ideas--what I was going for with some of the plot elements. We'd talk back and forth about details of the world and its history, and sometimes in that conversation it would become clear that we'd need to go back and talk about the fundamental themes of the book--how people react to fear, etc--before we could do anything else. You needed to know what the heck I was trying to do. JORDAN: Exactly. I think it was when we were talking about the backstory of the wizard trees that we realized the important thing at issue wasn’t the backstory itself, or even the way in which the backstory had been twisted into a lie – but rather why the people of the Shining City needed the lie. ANNE: Right. And I'd start babbling about master narratives and Puritans and making things even more confused. I knew what I was trying to do on an instinctive level, but that wasn't quite enough to put all the pieces together on the page. And then there was a time when I was working on the last draft I called my mom over and she and I sat down at the dining room table and talked back and forth for an hour only about the backstory, the things that happened hundreds of years before the book opens, before we got it solidified. Sometimes you need your mom. Of course, little of this backstory we generated actually shows up in the book. But I needed to know it so the book itself made sense. Which gets back to the first point: fantasy is hard. JORDAN: True words. Do you ever see yourself writing another fantasy set in an invented world? ANNE: There you are again with your Can we talk about the next book? You should live in the moment. I agree with Anne, I think writing fantasy is hard. That is why my stories are placed in the real world. This sounds like an interesting book - I love the idea of magical trees. The cover pulled me in immediately and the interview sealed the deal. Can't wait to pick up a copy and delve into this fantasy world. Thanks! I enjoyed that ( Anne's last comment made me laugh! ).